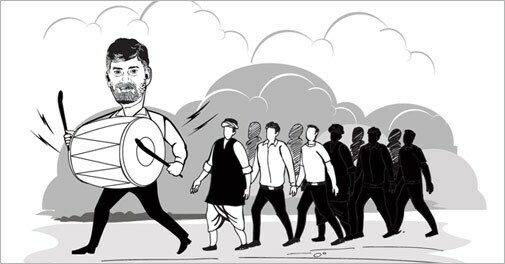 As the Chief Minister of undivided Andhra Pradesh from 1995 to 2004, Nara Chandrababu Naidu was called the state's CEO for his investment-driven policies. As the Chief Minister of undivided Andhra Pradesh from 1995 to 2004, Nara Chandrababu Naidu was called the state's CEO for his investment-driven policies. Now, as the Chief Minister of the residuary Andhra Pradesh, he is behaving like its CSR head. One of his first acts is to initiate a waiver of loans worth Rs 54,000 crore taken by farmers. Other decisions include an increase in pension to the old and the handicapped, mineral water in villages at Rs 2 a litre, and an increase in retirement age for state employees. These sound like just the kind of dole-based policies the UPA used to swear by, the kind that Prime Minister Narendra Modi panned in his campaign based on governance, opportunity, and efficiency. As they say, the nation would wait for his response to Naidu, a powerful ally. In our June 8 edition, Arpita Mukherjee told you about Uber, the app-based private cab service. Set up five years ago in San Francisco, Uber has now raised $1.2 billion at a valuation of $17 billion. That makes it worth more than traditional car rental giants Hertz and Avis, and almost as much as Twitter and LinkedIn. But perhaps the bigger blast of publicity for Uber is coming from the strike by cab drivers in Europe. Uber says there has been an 850 per cent rise in sign-ups since London came to a halt. News outlets are quoting experts who call it an "own goal" by taxi drivers and "PR gold" for Uber. Talking about goals, Goldman Sachs has done its usual number crunching to predict an Argentina versus Brazil final at the soccer World Cup in Brazil. If that dream comes true, the tournament, which began on June 12, will likely score its projected TV viewership of more than a billion. However, it's not really a fairy tale panning out; a large section of Brazil's soccermad population is surprisingly cool to the tournament, and hot under the collar over corruption and the splurge over the event when the country suffers from extremes of poverty. The build-up to the tournament was noticeable more by strikes and protests than celebration. If you like to get intimate on the phone, try not to do something that's illegal or jeopardises national security. For that might mean your communication becoming a threeway affair, the third party being a government official. Telecom operator Vodafone said in its first Law Enforcement Disclosure Report that governments of 29 countries, including India, regularly made requests for data about users. Some of them, Vodafone said without naming the countries, could tap directly into its network, even without legal warrants. It did not disclose details of India's tapping and access because it is against the law here for a telecom carrier to reveal information about interception of calls and messages. The new government is hoping for some heavenly intervention after the Met department forecast of deficient monsoon rainfall spread some panic. The chances of an El Nino effect, which had caused the worst drought in 37 years in 2009, are pegged at more than 70 per cent now against 60 per cent in the first prediction for this year. So, wait and see if all this will lead to food inflation and shortage of, among other things, onions, the bugbear of any government. The government will not be able to blame the UPA regime for poor rainfall -witness just how the other day Finance Minister Arun Jaitley blamed the previous government for the economic mess. And, we are not alone fighting the inflation battle. Neighbouring China's inflation accelerated in May to its fastest pace in four months. Consumer prices rose 2.5 per cent from a year ago. The economy is projected to grow this year at the slowest pace since 1990. That has not stopped China from toppling Germany and Japan in the rank of countries by private financial health. China's $22 trillion is expected to increase more than 80 per cent to $40 trillion by 2018, according to the Boston Consulting Group. -Here is one more proof that digital age is upon us, and spreading fast. The net user base in India, the third-largest after China and the US, is expected to double to 526 million by 2018. Cisco expects networked devices in India to jump to 1.8 billion by 2018. -Online hiring in India rose by 19 per cent year-on-year in May, registering the highest growth since February last year, according to job portal Monster.com. -Toyota Motor Corp is recalling about 650,000 vehicles in Japan because of potentially defective airbags, expanding a costly recall it announced in 2013 because the supplier, Takata Corp, had not fully identified the problematic parts. -A bank account can now be opened with just one address proof, permanent or local. The latest RBI decision will help migrant workers and employees with transferable jobs. -Norwegian telecoms group Telenor has sought the Indian government's approval to invest Rs 780 crore to raise its stake in its local unit, Uninor, to 100 per cent from 74 per cent. -Healthier breakfast options such as oats are getting increasingly popular in India, says a Nielsen India report. Oats occupy a 26 per cent share in the Rs 720 crore breakfast cereals market. Oats as a category grew 38 per cent in the last one year. Infosys, struggling with a leadership crisis and several exits at the top, has seen a change of guard again. Vishal Sikka, who led the "intellectual renewal" of enterprise software company SAP as its chief technology officer, was appointed the new Infosys CEO. Chairman N.R. Narayana Murthy will become Chairman Emeritus from October 11, after which board member K.V. Kamath will take his place. U.B. Pravin Rao, President and Director, has been promoted to chief operating officer. Ringing in the low-cost voice regime, Reliance Communications has slashed its outgoing calls by 55 per cent. The 'One India One Rate Plans' does away with roaming charges, and customers will pay the same rate for local, STD and roaming cals from anywhere in the country. Sistema Shyam TeleServices, which provides telecom services under the MTS brand, followed suit offering full talk time on all recharges starting at Rs 30 and 10 per cent extra talk time on recharges of Rs 150 and above for one year. Car sales grew by 3.08 per cent to 1,48,577 units in May. Positive sentiment over the formation of a stable goverment at the Centre and lower excise duty in the interim Budget helped dispel some gloom in the auto industry. -Google is buying Skybox Imaging in a $500-million deal that could serve as a launching pad for the Internet company to send its own fleet of satellites to take aerial pictures and provide online access to remote areas of the world. Google typically benefits when more people are on the Internet to see the ads that generate most of the company's annual revenue of $55 billion. -European Union, battling a financial crisis, is cracking down on tax evasion. The European Commission is probing whether generous tax arrangements granted to global corporations in three EU countries -Apple in Ireland, Fiat Finance and Trade in Luxembourg and Starbucks in the Netherlands - amounted to illegal state aid. Politicians are desperate to boost depleted national coffers and soothe voter anger over cuts to welfare programmes. -Chief financial officers in India led the Asian region in terms of investment and spending across business functions in the current financial year, according to an American Express study which surveyed CFOs at companies with turnover of $500 million in 12 countries. -The World Bank has predicted the world economy would grow 2.8 per cent this year, below its prior forecast of 3.2 per cent made in January.